Warlocks are staying true to the spirit of sacrificing their own minions for their personal gain. The card was revealed (slightly earlier than intended) by Nicholena on YouTube. Her video is quite entertaining and there's gameplay of the card included. This card has Egg Zoolock written all over it, although keep in mind that Devilsaur Egg rotates out of Standard in half a year. It seems like a more balanced version of Mark of the Lotus and I'd expect people are going to experiment with Grim Rally in different variants of aggro Warlock decks. It could also potentially replace Dark Pact in Cubelock. 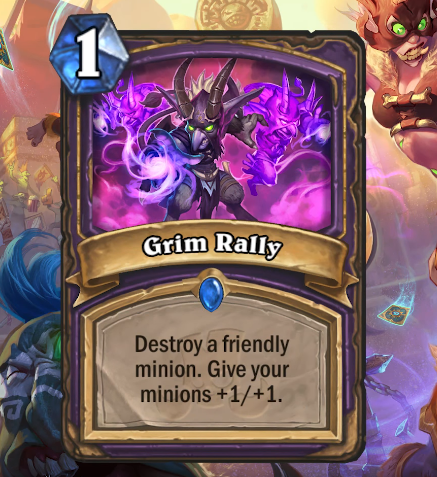 Grim Rally looks like a great addition in Wild to both aggro and Cube decks. Visit our Rastakhan's Rumble hub for everything you need to know about the last expansion of the Year of the Raven.